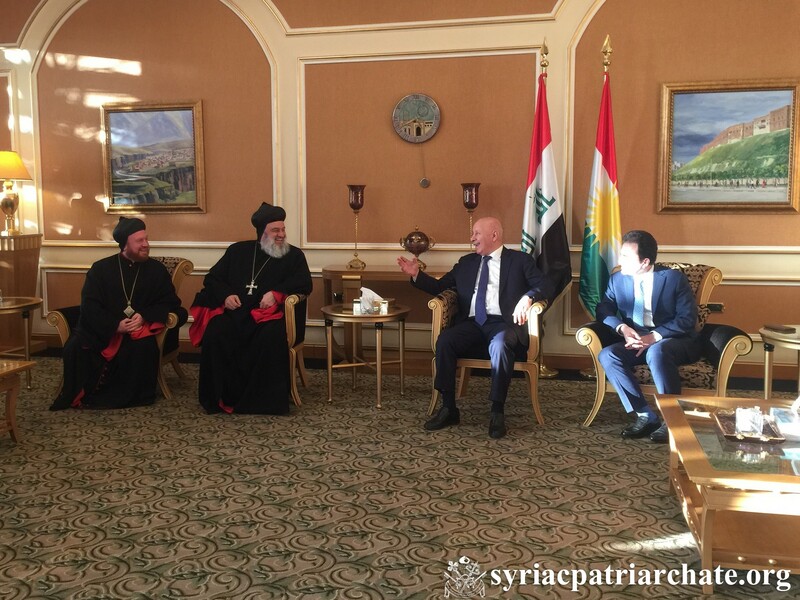 On January 24, 2019, His Holiness Patriarch Mor Ignatius Aphrem II arrived at Erbil International Airport in Iraq, on an Apostolic visit during which he will inaugurate the new Archdiocesan Headquarters of Mosul, Kirkuk and Kurdistan, in Erbil. He was accompanied by their Eminences: Mor Justinos Boulos Safar, Patriarchal Vicar in Zahle and Bekaa, Mor Timotheos Matta Al-Khoury, Patriarchal Vicar in the Patriarchal Archdiocese of Damascus, and Very Rev. Raban Joseph Bali, Patriarchal Secretary and Media Office Director. His Holiness and the accompanying delegation were received at the airport by an official delegation from Kurdistan Regional Government, consisting of Their Excellencies: Mr. karim sinjari, Minister for the Interior, Mr. Pishtiwan Sadiq, Minister of Education. His Eminence Mor Nicodemus Daoud Sharaf, Metropolitan of Mosul, Kirkuk and Kurdistan, as well as their Eminences Archbishops of Iraq: Mor Gregorios Saliba Chamoun, Patriarchal Advisor, Mor Severius Hawa, Archbishop of Baghdad and Basra, and Mor Timotheos Moussa Al-Shamani, Archbishop of the Archdiocese of Mor Mattai Monastery, and Their Eminences and Excellencies Archbishops from the various Christian Churches in Iraq also came to receive His Holiness.